Engage the hearts and minds of today’s church with this theologically sound repertoire of more than 360 contemporary Catholic songs for Mass! This hardbound Spirit & Song hymnal contains the latest releases and recent favorites from Choose Christ along with volumes 1 and 2 of Spirit & Song. Its repertoire of over 360 songs includes updated texts, prayers, responses and musical settings for the new English translation of the Roman Missal as well as revised text for the Order of Mass and five Mass settings for contemporary ensembles. In addition, the hymnal contains contemporary Catholic music, bilingual, English-Spanish songs alongside fresh arrangements of traditional hymns as well as selections for Morning and Evening Prayer, Reconciliation, Eucharistic adroation, retreats and more. Create a deeper connection to the liturgy with complete guitar accompaniments for all 368 songs in the new Spirit & Song hymnal—in one easy-to-use resource! Use these inside pages with the Storage Binders and Service Binders. Find the complete Keyboard Accompaniment (Binders + Inside Pages) here. This 3-ring binder-protected Spirit & Song Keyboard Book contains complete guitar accompaniments for all 368 songs of the latest hymnal edition, including the best from the previous two editions and 200 new titles. This perfect-bound (not spiral-bound) edition of Spirit & Song Guitar/Vocal Songbook contains complete accompaniments for over 350 songs including the best from the previous two editions, plus 200 new titles. This spiral-bound edition of Spirit & Song Guitar/Vocal Songbook contains complete accompaniments for over 350 songs including the best from the previous two editions, plus 200 new titles. Use these inside pages with the Storage Binders and Service Binders. Find the complete Guitar Accompaniment (Binders + Inside Pages) here. This 3-ring binder-protected Spirit & Song Guitar Book contains complete guitar accompaniments for all 368 songs of the latest hymnal edition, including the best from the previous two editions and 200 new titles. Vol. 9 (Discs Q & R) of the CD Library features General Songs from the Spirit & Song hymnal. Vol. 8 (Discs O & P) of the CD Library features General Songs from the Spirit & Song hymnal. Vol. 7 (Discs M & N) of the CD Library features General Songs from the Spirit & Song hymnal. Vol. 6 (Discs K & L) of the CD Library features songs for Gathering & Sending and Communion – all from the Spirit & Song hymnal. Vol. 5 (Discs G & H) of the CD Library features music for Lent, Palm Sunday, Holy Week, Easter, Ascension and Pentecost – all from the Spirit & Song hymnal. Vol. 4 (Discs G & H) of the CD Library features music for Lent, Palm Sunday, Holy Week, Easter, Ascension and Pentecost – all from the Spirit & Song hymnal. Vol. 3 (Discs E & F) of the CD Library features Liturgical Prayer, Ritual Music and songs for Advent, Christmas and Epiphany – all from the Spirit & Song hymnal. Vol. 2 (Discs C & D) of the CD Library features Psalms and Liturgical Prayers from the Spirit & Song hymnal. Vol. 1 (Discs A & B) of the CD Library features Mass Settings, Service Music and Psalms from the Spirit & Song hymnal. This 18-CD, all-inclusive digital edition features complete recordings for all the hymns, songs and service music in your Spirit & Song hymnal. This MP3 playlist for Disc R of the CD Library features General songs for worship. This MP3 playlist for Disc Q of the CD Library features General songs for worship. This MP3 playlist for Disc P of the CD Library features General songs for worship. This MP3 playlist for Disc O of the CD Library features General songs for worship. This MP3 playlist for Disc N of the CD Library features General songs for worship. This MP3 playlist for Disc M of the CD Library features General songs for worship. This MP3 playlist for Disc K of the CD Library features music Gathering & Sending and Communion. This MP3 playlist for Disc J of the CD Library features music Gathering & Sending. This MP3 playlist for Disc I of the CD Library > features music for Christ the King, songs for the Blessed Virgin Mary and Gathering & Sending. This MP3 playlist for Disc H of the CD Library features songs for Easter, Ascension and Pentecost. This MP3 playlist for Disc G of the CD Library features music for Lent, Palm Sunday and Holy Week. This MP3 playlist for Disc F of the CD Library features music for Advent, Christmas and Epiphany. This MP3 playlist for Disc E of the CD Library > features Liturgical prayer and Ritual music. This MP3 playlist for Disc D of the CD Library features Psalms and Liturgical prayer. This MP3 playlist for Disc C of the CD Library features Psalms. This MP3 playlist for Disc B of the CD Library features Service music and Psalms. This MP3 playlist for Disc A of the CD Library features five Mass settings chosen specifically for contemporary ensembles, including Mass of a Joyful Heart, Mass of Renewal, Mass of St. Timothy, the new Mass of the Desert by Tom Booth and Mass of Saint Ann by Ed Bolduc Mass settings. 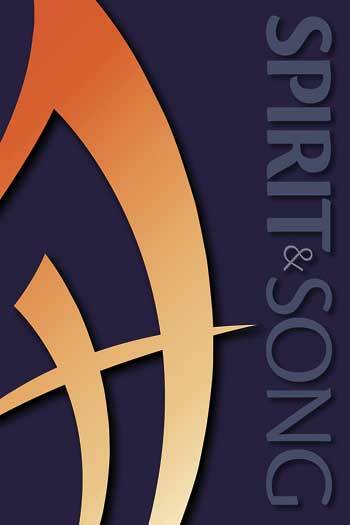 Spirit & Song is an incredible resource for any parish looking to forge a deeper connection with today’s church. With more than 360 songs, all carefully selected by a panel of theological experts and Catholic scholars, this hymnal takes the best from the previous two editions and supplements them with 200 new titles that speak to the entire community. 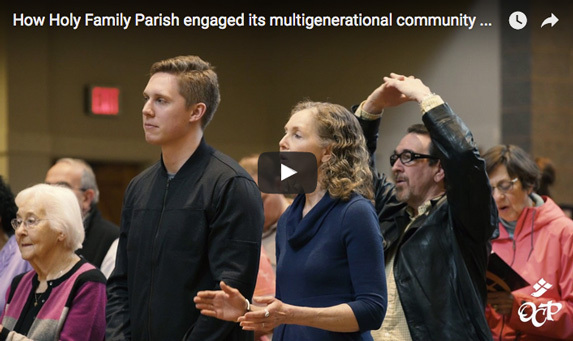 Learn how one church in the Pacific Northwest united their multigenerational parish with Spirit & Song. This hymnal taps into the natural enthusiasm of youth and young adults and encourages them to spread the good news with new ardor. It combines modern language and music to form new expressions of the ancient faith, and the groundbreaking digital edition equips you with new methods to engage today's generation of parishioners. Enhance the liturgy and inspire your musicians and choir with the hymnal that represents the very best in contemporary music for Catholic worship.